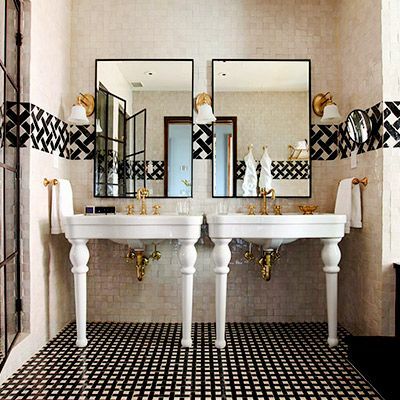 Showstopping bathrooms are truly a feast for the eyes. No matter how big or small, a well-designed bathroom will capture our hearts—it’s no wonder it’s one of the main selling factors in real estate. If you’ve planned to renovate your bathroom this year and are in need of some inspiration, look no further. Keep scrolling for our ultimate round-up of the most jaw-dropping bathrooms around. Art can make or break a room, and that doesn’t exclude the bathroom. This stunning black and white minimal bath is accented with a bubble gum pink print by Damien Hirst. This might be one of the most stunning bathroom combinations we’ve ever seen. Concrete walls and a marble vanity? Consider us sold. The mix of high and low materials is edgy yet refined. We also love the use of a large round mirror and single bubble pendant. The cool green subway tiles in this Prospect Park West townhouse are complemented by a contrasting rust-colored rug. The Apparatus Studio sconcesand black fixtures give the timeless space a more contemporary look. The master bath in Jenni Kayne’s Beverly Hills house is one of our all-time favorites. Can you imagine soaking in this stunning Waterworks cast iron bathtub? The antique alabaster pendant elegantly casts a soft light, which is reflected in the large mirrors and veined marble wall. The Gachots cleverly outfitted this bathroom with a full-sized illustration from the 1959 edition of Henry Dreyfuss’s The Measure of Man. The walls and ceilings are covered in a mosaic of triangular tiles. Carrara marble elevates any bathroom, whether used in small or large quantities. Here, marble floors and walls dominate the space, which is accented with a red shower fixture, leather hanging mirror, and vintage wooden stool. The curved ceiling of this Sydney bathroom makes the room, but the copper penny round tile backsplash is the showstopper. The bathroom is accessorized with more copper accents, as well as raw organic materials to give it a laid-back feel. Who could be so lucky to have such glorious clear stained glass windows in their bathroom? 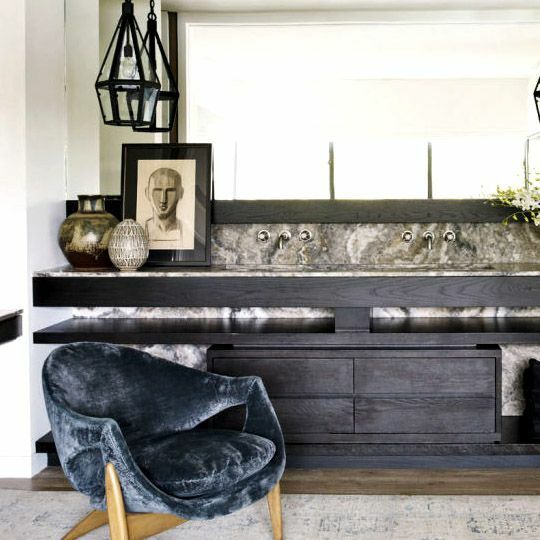 This arresting feature shines on its own, with the rest of the finishes and accessories kept minimal and neutral. We love the repetition of curves in this bathroom. From the curvaceous vanity mirrors to the cylindrical sconces, penny round tiles, and rounded vanity pulls, this bathroom is feminine yet minimal. This Montreal bathroom was outfitted with oversize hexagonal floor tiles and a schoolhouse sink. The black painted ceiling gives the room a comforting feel by repeating the color of the floors. This petite bathroom doesn’t need much to shine: simple hexagonal black tiles, a clawfoot tub, and aged brass fixtures. The marble backsplash wall finishes the space with a small built-in shelf on which to prop bath necessities. With large windows letting the sunshine in and a round freestanding tub, this bathroom showcased in Los Angeles’s The Apartment by The Line is basically what dreams are made of. Beautiful bath accessories finish the look. In the ultimate dream bathroom category is this space designed by Vanessa Alexander. The soak tub stands in front of a fireplace, and is surrounded by accent furniture and luxurious bath products. A plush Moroccan Beni Ourain rug completes the look. A freestanding soak bathtub with a view will always win our hearts, and the bathroom in this Victorian Melbourne townhouse is no exception. The marble hexagonal tiled floors and subway tiled walls provide a sense of intimacy, while a shower curtain hanging from the ceiling gives the space privacy.